Before Cassini's journey through the Saturnian system, popular opinion held that Pandora and Prometheus, two of Saturn's moons, teamed up, creating the F ring's unique shape and orbit. But, data from Cassini proves otherwise. NASA's Cassini mission to Saturn came to an end on Sept. 15, 2017 when the spacecraft dove into Saturn's atmosphere. As Cassini headed for its final moments , it turned back from the planet to point its cameras at Saturn's moon Pandora and the faint F ring. Before Cassini's trek through the Saturnian system, popular models held that Pandora and Prometheus, two of Saturn's moons, created the F ring's bizarre, narrow structure with their gravitational pull. However, data from Cassini proves otherwise. So, while Prometheus restricts much of the F ring, Pandora seems to act as a perturbative influence on Prometheus' own gravitational resonances. 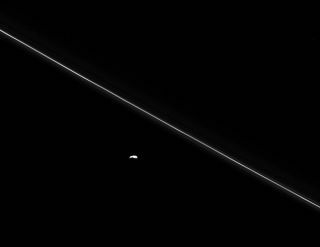 "Prometheus establishes stable locations for F ring material where the moon's own gravitational resonances are least cluttered by the perturbing influence of its sibling satellite, Pandora," NASA officials said. Cassini grabbed this image on Sept. 14 when the spacecraft was 360,000 miles (577,000 kilomeers) from Pandora and 28 degrees above Saturn's ringplane. The Cassini mission lasted 20 years , with 13 of those spent traversing Saturn and its rings and moons . The mission was a cooperative project with NASA, the European Space Agency and the Italian Space Agency.